The Province of Nova Scotia is located at the far eastern tip of Canada on a bit of land that stretches into the Atlantic Ocean like a giant prehistoric fish with its tail and top fin extended to maximize mass. 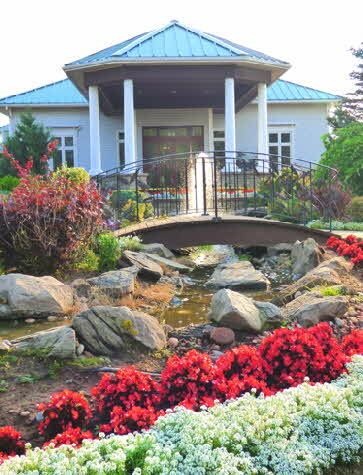 Part of Atlantic Canada along with New Brunswick, Newfoundland & Labrador, and Prince Edward Island; Nova Scotia is renowned for its stunning natural beauty, charming seaside villages, and delicious foods and wines; a veritable cornucopia of attractions for all ages and interests to enjoy. After a few days of extreme pampering, we bid farewell to Fox Harb’r and went in search of the authentic Nova Scotia. 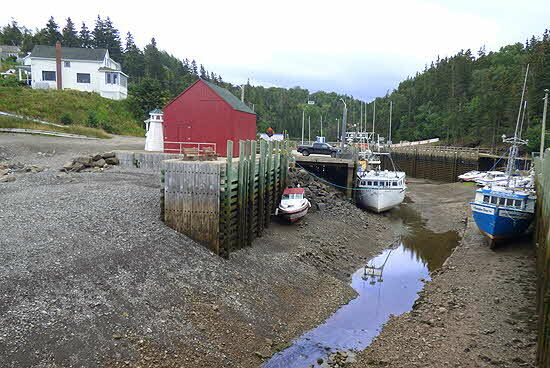 We headed west passing fishing villages, farming communities and scenic drives to the charming seaside village of Hall’s Harbour, a perfect spot from which to watch the famous tidal surge at the Bay of Fundy, known for having the highest tides in the world. We arrived early during low tide to see the strangely eerie sight of fishing boats and lobster traps stranded on the harbor bottom. Slowly the rising tide -- as much as an inch a minute -- lifts the marooned boats to the 40-foot high water mark. Patience is required, since the phenomenon takes several hours to complete, but our time was well-spent partaking of the world-renowned Bay of Fundy lobster at “Lobster in the Rough�” and taking pictures of the ever-changing scene as the tides ebb in. 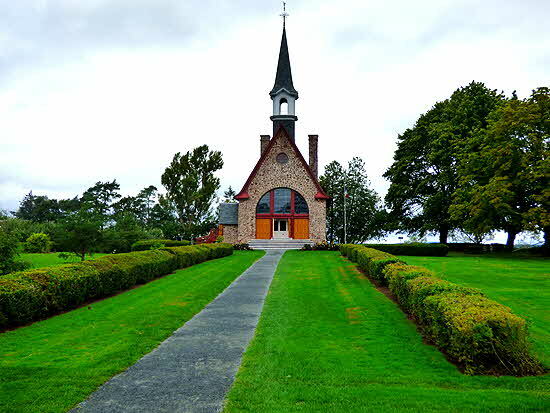 Next stop was “Grand Pre National Historic Site”�� one of three UNESCO World Heritage Sites in Nova Scotia. Here we learned the tragic story of the Acadian’s (pronounced Ak a dee ans emphasis on first syllable). These French Huguenots fled their homeland seeking religious freedom in the new world and settled in the Grand-Pr� area as early as 1682. They developed unique fishing and farming methods in a semi-autonomous community relying heavily on the Mi’kmaq indigenous population with which they developed a peaceful, symbiotic relationship. In 1755 at the beginning of the Seven Years War between France and Great Britain, they refused to take sides in the conflict by signing an oath of allegiance to the British Crown. As a consequence, they were forcibly deported as a security risk under appalling conditions in which they lost their hard-won lands, and in many cases their families, which got separated in the round-up that many did not survive. You can visit the museum and view the graphically depicted story of the Deportation and subsequent return, then take a stroll to the memorial church and magnificent landscaped gardens. We traveled south towards the southern shore, passing vineyards and farms along the way, until we reached the seafaring town of Lunenburg. The delightful town of Lunenburg is a throwback to an earlier age with its colorful waterfront, horse-drawn sightseeing buggy rides, narrow winding streets, and pastel-colored clapboard houses on steep hills rising up from the harbor. Originally the Victorian (early 19th century) and earlier 18th century houses - happily many of which have been, or are being, restored - were painted conservatively in lovely pastel colors but some years ago a young whipper-snapper chose to paint his newly acquired home a bright color… much to the consternation of the locals. 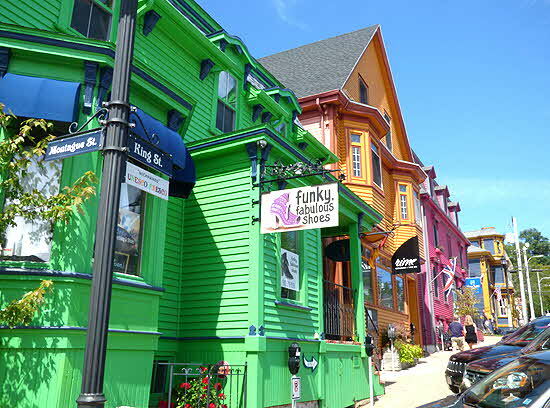 Other young homeowners followed suit and after much ado, Lunenburg has become as famous for its cheerful colored Victorians as its lobster rolls. A good way to experience the town is by taking one of the many tours offered; we opted for a walking tour with “Essential Lunenburg Tours”��. Kerriann, our bubbly guide, is an 8th generation local and can document her ancestry back to 1776... on both sides! She could also dish the dirt and clued us in to the local gossip circa 18th & 19th century... what fun! She pointed out the famous Lunenburg bump - the extension on the front of many of the houses - and the coffin window, de rigueur in the days prior to funeral parlors when deceased family members would be viewed at home. Every house was built with an 8x8 foot wood shuttered window in its parlor. In the event of the passing of a family member, a hearse would back up to the window and after the funeral held in the parlor; the coffin would be slid directly into the waiting horse-drawn vehicle and taken to the cemetery. 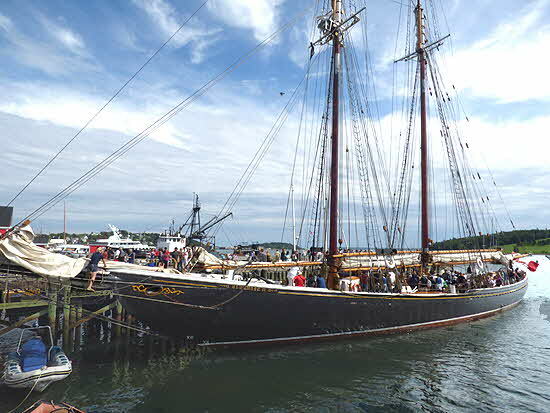 Lunenburg has a dual history of rum running and shipbuilding and Old Town Lunenburg is listed as a UNESCO World Heritage Site. 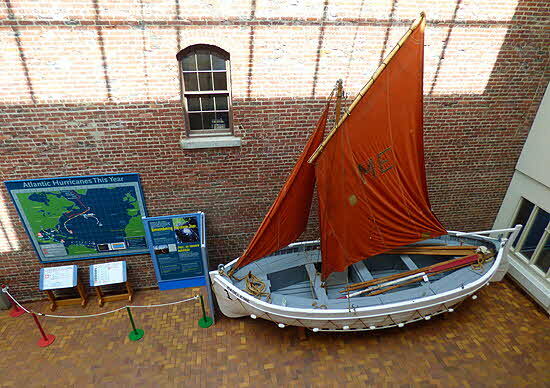 It’s also home to Nova Scotia’s famous racing schooner, “Bluenose II”�� (featured on the Canadian ten-cent piece) that was in harbor when we visited. One morning as we enjoyed a leisurely alfresco breakfast overlooking the harbor, we watched long lines of enthusiastic tourists cuing up for a ride. 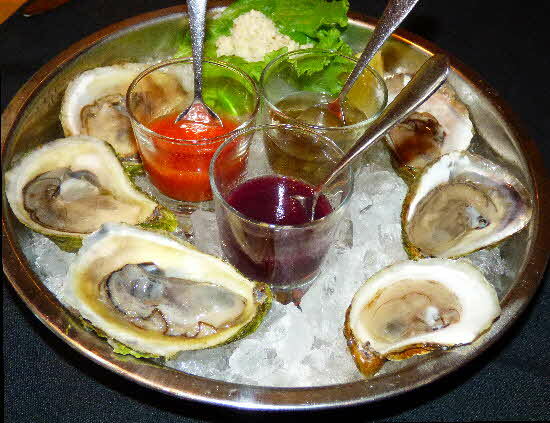 One of the joys of Nova Scotia for us was the consistently fresh, cooked to order, locally sourced, deliciously prepared food we found at every meal - regardless of the ambiance of the restaurant - the food was always outstanding. Can’t have food without drink, so we popped in to “Ironworks Distillery”�� a family owned and operated boutique distillery for a tasting and chat with the brewmaker. Ironworks produces vodka and liqueurs from locally grown fruit and is housed in an 1892 marine blacksmith’s building; hence the name. 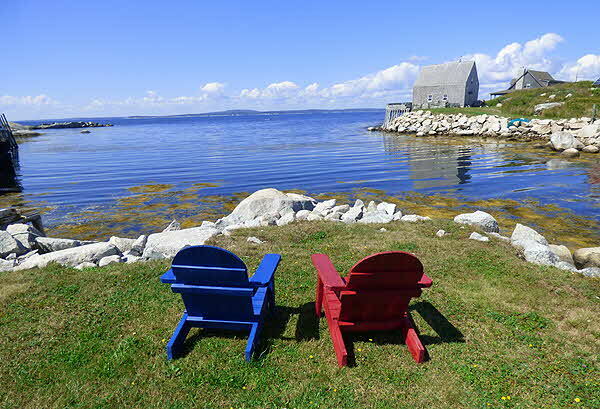 Mahone Bay�� an artist’s haven is another charming waterfront community of craft shops and wonderful eateries that we passed along the route that led us to the iconic coastal village of Peggy’s Cove�. The tiny harbor just below the lighthouse is one of the most photographed spots in all of Canada. The day we were there was lovely, with an amazing blue sky, artistically drawn puffy white clouds, and massive boulders polished by sea and wind making a stark graphic statement against the splashing waves. 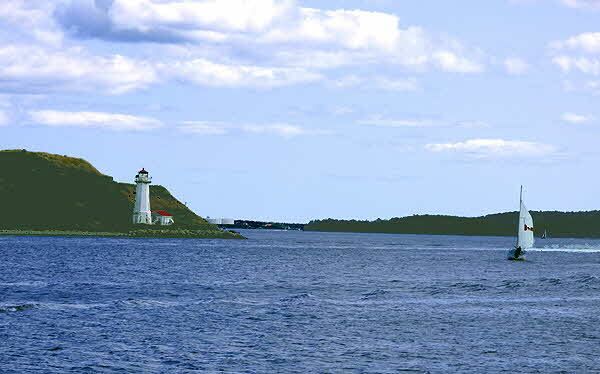 We pulled ourselves away from the dazzling scene and continued to Halifax, the capital city of Nova Scotia. Halifax is a bustling city of tree-lined streets and modern high-rise buildings but its heart is deeply rooted to the past... and what a past! The Canadian Museum of Immigration is� a beautifully organized museum at Pier 21 on the waterfront dedicated to exploring the immigrant experience of Canada. The friendly staff leads tours that bring the depicted first-person accounts to life and connects the viewer with the events of the past in a meaningful way by recognizing the immigrant’s ongoing contributions to the building of Canada. While the Maritime Museum of the Atlantic�� houses artifacts retrieved from the 1912 sinking of the Titanic and recounts the story of Halifax’s contribution as the closest major port in the rescue and recovery process. It also tells the stories of several shipwrecked vessels that sank closer to home, in Halifax Harbour. Halifax is a great base from which to visit historic and scenic sites on land, water, or both, in amphibious vehicles. You can go kayaking, take a segway tour or ride a bike, or just take a good old-fashioned walk along the scenic boardwalk fronting the water. A city tour with Ambassatours Grayline�� covered all the local high points and took us from the commercial waterfront through the city while our expert driver Paul, titillated us with stories and tall tales. We arrived at the Citadel National Historic Site in perfect time to watch the hourly changing of the guard at the star-shaped fortress, home to the 78th Highland Scottish Regiment. 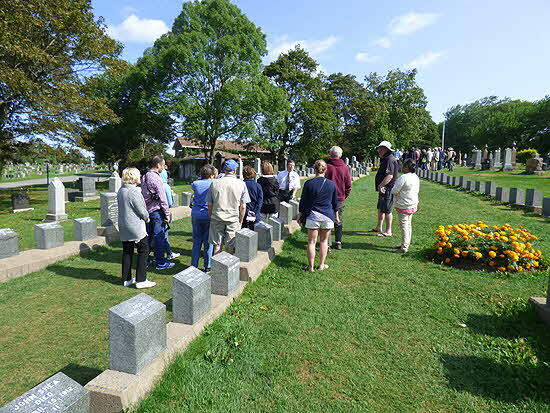 But for me, the most unforgettable stop on the tour was a visit to Fairview Cemetery the final resting place of 121 souls from the RMS Titanic. The tragedy of the Titanic sinking is palpable at the memorial site, which is laid out in the shape of a ship’s bow with stately marble markers serving as individual monuments to those that perished. There are another 10 persons interred at the Jewish section of the cemetery and 9 others at the Catholic section, making Halifax the largest receiver of victims of the catastrophe. Halifax has the unfortunate moniker of “city of sorrows”, earned not only as the final resting place of the majority of bodies recovered from the Titanic but also for another ship disaster that occurred a few years later on December 6, 1917. This civilian tragedy of World War I - the war to end all wars - is considered by many to be the worst man-made explosion of the pre-atomic age. The French munitions ship Mont Blanc rushing to join a military convoy crossing the Atlantic, and the Norwegian ship IMO carrying Belgium relief supplies, collided in the Halifax Harbour narrows with devastating results. Thousands died instantly, many thousands more were injured or blinded by the blast. A huge part of Halifax was instantly leveled, but like Phoenix raising from the ashes the city recovered and rebuilt better than ever. Halifax is a very walkable city with a park-like waterfront perfect for strolling or stopping at one of the restaurants, caf�s, or pubs for an ever changing, but always lovely, views of Halifax Harbour. Shopping opportunities abound with many handcrafted items fashioned right before your eyes, making the souvenir purchase so much more memorable. Luckily we were in Halifax on a Saturday which is when the Seaport Farmer’s Market pulls out all the stops. This foodie paradise is the oldest farmer’s market in North America and boasts nearly 250+ vendors and a green roof with spectacular views over the Harbour. 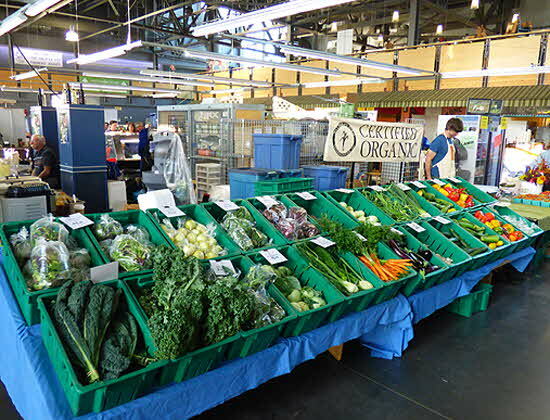 The produce available in tiny Nova Scotia is second to none and we saw not only beautifully displayed fruits and vegetables but varieties of unfamiliar produce... what a treat. Mouth watering home-made baked items and breads were on sale as well as ethnic foods cooked right on premises. But an even bigger treat was the wonderful home-made confections we saw in booth after booth. What a dilemma to select just one out of the many mouth-watering choices when they all looked and smelled so delicious. My final selection was scrumptious but left me wishing I had a bottomless pit so I could down many more. Halifax has many microbreweries and distilling companies that offer tours and tastings such as the Halifax Distilling Company and Alexander Keith’s Nova Scotia Brewery, bothon Lower Water Street within easy walking distance of each other. We ended our visit in Halifax with a fond farewell and convivial hoisting of a brew.